<ˌpapaˈtsules>) (Mexican Spanish, from Mayan IPA: <papatsʼu:les>) is a traditional dish from the Yucatan Peninsula resembling enchiladas. 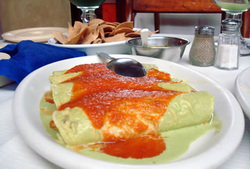 In its simplest form it consists of corn tortillas dipped in a sauce of pepita (pumpkin seeds) filled with hard-boiled eggs, and garnished with a cooked tomato-chile sauce. Xibalba: In Maya mythology, Xibalba ( /ʃɪˈbɒlbə/), roughly translated as "place of fear",<1> is the name of the underworld, ruled by Maya Death Gods and their helpers. In Yucatec, it was known as Metnal. 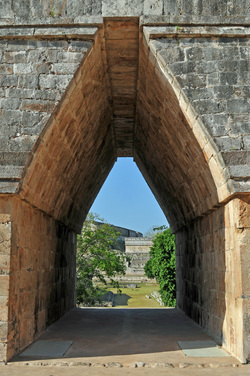 In the 16th-century Verapaz, the entrance to Xibalba was traditionally held to be a cave in the vicinity of Cobán, Guatemala. According to some of the K'iche' Maya presently living in the vicinity, the area is still associated with death. Cave systems in nearby Belize have also been referred to as the entrance to Xibalba as well the just discover cenote in Chiche-Itza. 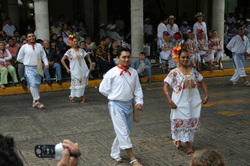 Mexico, being grown extensively in Yucatán, Veracruz, and southern Tamaulipas. 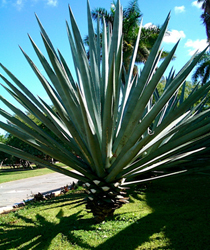 It is also used to make Licor del henequén, a traditional Mexican alcoholic drink.The plant appears as a rosette of sword-shaped leaves 1.2 to 1.8 meters long, growing out of a thick stem that may reach 1.7 meters (5 ft). The leaves have regularly spaced teeth 3-6 mm long, and a terminal spine 2-3 cm long.Like the sisal, A. fourcroydes is a sterile hybrid; the ovaries never produce seeds. prefer to use the frequent suckers, which develop more quickly. Deep well that historically had been used by the Mayans as a site for sacrifices to Chac, the rain god.